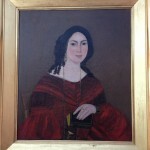 In Part I of “My Ghost Gertrude,” I revealed that I acquired a painting of Gertrude ****, an elegant woman of Dutch heritage who lived in the 1800s. I also said that within a short time of the acquisition, strange things began to happen that led to my realization that the woman in the painting had entered my life as a ghostly spirit. I ended Part I by telling of recurrent dreams in which the names of two people came to me. Names I had never before heard. They were Adrian and Annatje van ****. One name was male and the other female. By this stage in my relationship with Gertrude, I knew she had sent me the names. I had a sense of foreboding. She had given me the names, and I wondered about the reason. I decided to research the names but suspected nothing would come of it. Before I speak more of the people in my dreams, I would like to mention two additional incidents that happened. The first had to do with my alarm system. The system incorporated motion detectors that made a clicking sound when the detector’s beam was crossed and the system wasn’t armed. If the system was armed, a click wouldn’t be heard; instead, a loud siren would sound. As I slept with the alarm in armed mode, I heard frequent clicks that indicated the beam was being crossed; yet, the siren never activated. Testing of the system always confirmed it was in good working order. My wife Pauline and I came to the conclusion that the motion detectors were picking up Gertrude as she roamed around our home at night. We felt a spirit shouldn’t trip motion detectors, so she must have wanted us to know she was around. The second incident occurred upon my return to my home late one moonless night. As I entered my driveway, I noticed the post lamp was lighted. I was grateful that Pauline had turned it on. Moments later in the house I flipped the light switch to turn the post lamp off. It came on. I was sure the light had been on when I arrived home. I had made a mental note of it intending to thank my wife for doing it. I ran to the bedroom to ask if she had turned the light on for my arrival and then off after I drove into my attached garage. It turned out that she had been fast asleep and had done neither. To me, it was another proof that a ghost occupied our home. The incident caused Pauline and me to conclude that Gertrude was benevolent and protective. If you’re going to have a ghost in your home, that is the kind you want. Back to my unusual dreams … I did an ancestry search on Gertrude and discovered her family came from The Netherlands in the 1700s and settled within the Dutch colony of New York City. From there, the family moved with many other Dutch families to the Schenectady region of New York where a Dutch enclave was established. As in many such ethnic groups in the U.S., I surmise that the people were close, and a member would know most, if not all, of the other members of the community. As I said, I didn’t expect anything to come of it, but when I did an ancestry search on Adrian and Annatje van ****, I found that they were real people who lived in Schenectady in the 1700s. Not only that, but Gertrude’s family lived in the same community, and her ancestors had married members of the van **** family. Gertrude had given me the names of real people that had close ties to her family. I was sure she wanted me to delve further into the lives of Adrian and Annatje van **** and their relationship with her family. Within me, I had the feeling that in the 1700s Dutch colony in Schenectady something ominous had occurred that involved Gertrude’s family and the van **** family. In Gertrude Part III I will speak of Adrian and Annatje. I will also relate how Gertrude made her presence known to a couple who visited us.